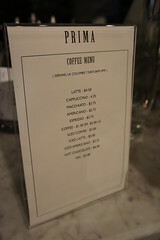 In actuality, Prima is a restaurant, but one that does coffee well. Rather than treating coffee as “secondary” to the food, Prima puts an enormous amount of effort and resources into their coffee operation. As my introduction to NY coffee, I was definitely impressed by the quality of East Coast roasteries and what I perceived as a “more professional” approach to coffee. 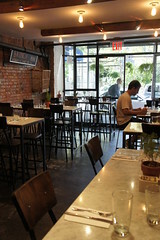 This trendy little eatery has an elegant atmosphere, making it an inviting spot to stop in for a drink. At the back of the store stands their island-bar , an “indoor kiosk” that serves their coffee. 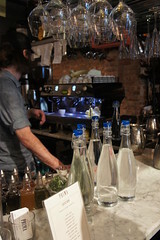 The bar is equipped with quality brewing apparatuses, Fetcos, and an EB, definitely making a strong statement about their commitment to quality. They source their beans from La Colombe, a solid East Coast roaster. I was originally struct by the erratic pricing . While a regular coffee is a mere $1.50 (what a good price), their caps are $4.25, which seems a bit extreme on both ends of the spectrum. Since I had just finished a heavy meal, I opted for coffee instead of my regular cap. For the price, it was phenomenal. Compared to other shops, it was still pretty good. While it was a darker roast, it had a solid, balanced flavor that did not have any exceptional characteristics that made it stand out. Great mid-day treat. Our barista was extremely friendly, welcoming, and got us into a great conversation about music and the 90s. 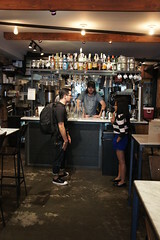 Very casual and approachable, down to earth coffee hospitality. Glad to see their staff is well versed and committed to their mission of quality. 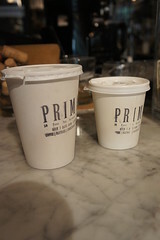 Prima is a solid stop for coffee in its own right. Whether you are looking for a meal or a place to recharge, for the price, Prima won’t disappoint.